Asahi are the brand behind Asahi beer, Pilsner Urquell, Meantime, Kozel, Peroni and more. Across their impressive portfolio of beers, Asahi have a very large sales team who are often on the move and always busy. They needed a single repository for all their sales materials and assets, that they could easily access and filter through to find the sales deck or logo they need. Formulate built them their own Digital Asset Management (DAM) system - the Asahi Sales Toolkit. The activation team back at head office can upload assets to the system in bulk, and categorise them accordingly, for employees to quickly search for on the front end. Asahi users can log in using Active Directory, negating the need to remember multiple credentials, and can share assets with wider contacts by generating sharing links which last 48 hours before expiring. 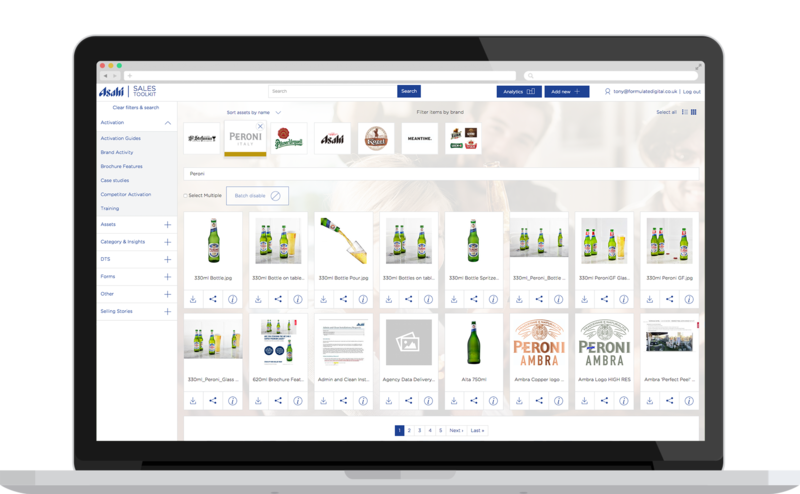 We are now in the process of integrating the toolkit with Asahi’s print marketing tool, which the sales team use to manage print asset creation for bars, pubs and other stockists. By hooking into an API, users will be passed straight through to the print marketing platform using their Sales Toolkit login. Exportable reports are generated for administrators on most commonly downloaded and shared assets, as well as which users are most active over a certain time period, using Chart.js graphs. Through the Business Intelligence these provide, Asahi can continue to understand more about their sales team and their most effective marketing assets. For further informationabout this case study or how we can help you, please complete the form below and we'll get straight back to you.